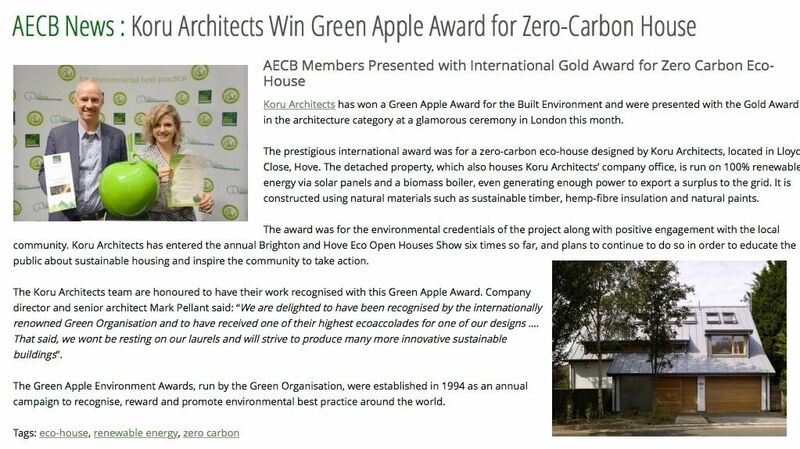 ‘Koru Architects Win Green Apple Award for Zero-Carbon House’ on AECB blog, August 2016. Following our Gold Green Apple Award for our zero-carbon house in Hove, the Association of Environmentally Conscious Builders (AECB) featured our achievement on their member news blog. Screenshot from the AECB blog post. Read the full version here. And you can find out more about our award-winning zero-carbon home/office with our Lloyd Close Koru Architects Case Study. (Downloadable PDF).